Rocky Road is a rare treat for a vegetarian, and like all of my favourite recipes, you don't have to be at all precise with quantities. 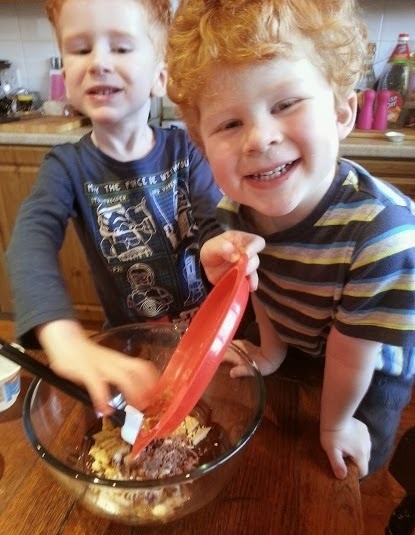 It doesn't need baking and so it's perfect for cooking with kids. 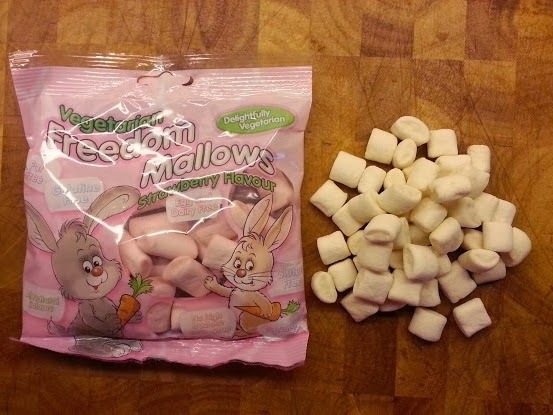 I was sent some strawberry and some vanilla marshmallows from Freedom Mallows to review - they're Gelatine Free, Vegetarian, Vegan, Halal, Gluten Free, Dairy Free and Fat Free and it's a perfect time to introduce my 2 youngest to the joys of making Rocky Road. The first step with Rocky Road is to take some chocolate and break it into pieces, in our case a standard 150g bar of dark chocolate. Add around 25g of butter and 1 tablespoon of golden syrup (if you wish) for each 100g of chocolate. 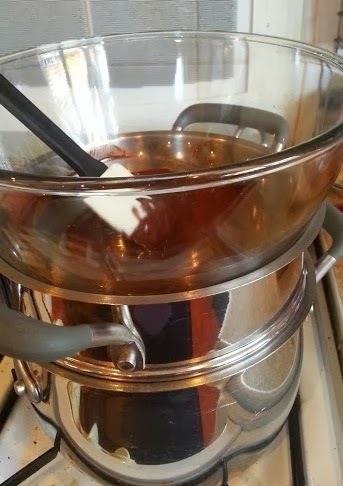 Melt in a double boiler or in a bowl over a saucepan or steamer over a gentle heat - don't let the water touch the bowl or it can burn the chocolate and it spoils the taste. While that's melting you need to get all your other ingredients ready. You need around 4 biscuits of your choice per 100g chocolate. Digestives are traditional, but I like to use shortbread as well. Crush them or crumble them with clean hands or a rolling pin, but leave them quite chunky. The rest of the ingredients are up to you. 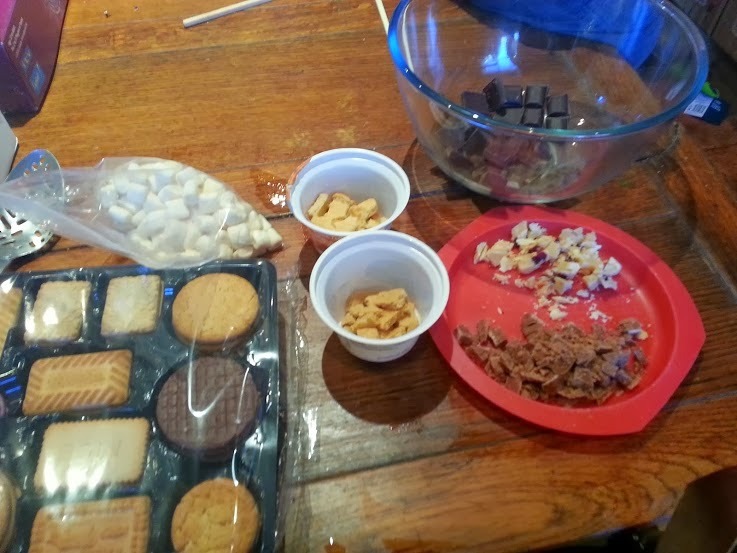 We chopped up some fudge and we also used some chocolate orange buttons. You can use dried fruits, smarties, sweeties, and all kinds of other sweet treats. be quick before the chocolate sets hard. If you have ingredients that will melt, add them last of all - when the chocolate has cooled enough that it won't just melt them. 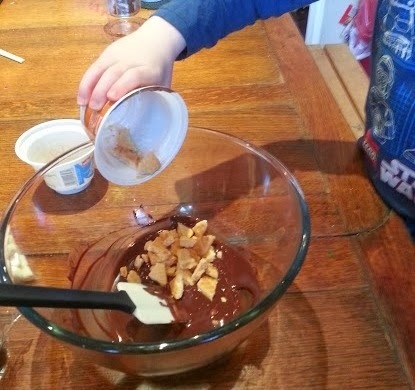 If you think your mixture has too much chocolate at this point then add some more ingredients. As long as they're coated in chocolate it'll work. If you prefer more chunky chocolate and less added extras then make it how you like it! 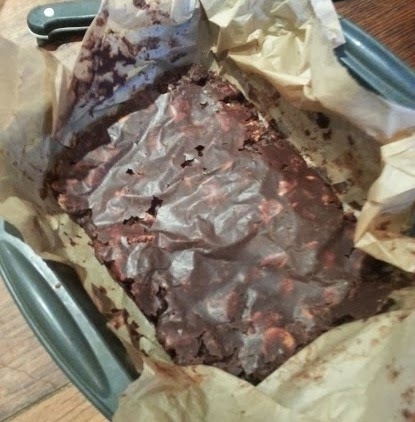 Put your mixture into a deep tray lined with greaseproof paper and press it down hard to pack it together. 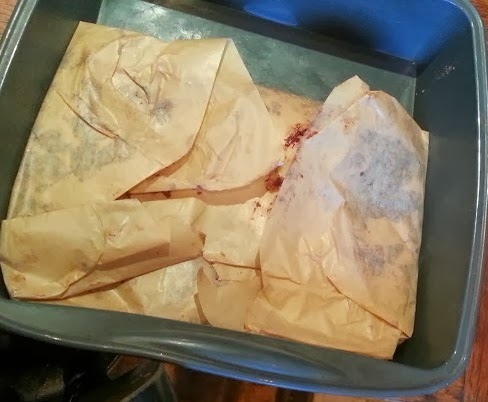 If you don't have greasproof paper you can just press it down with clean hands, the back of a spoon or a spatula. Put it in the fridge for an hour or two until it's well set. Freedom Mallows are currently available from Harvey Nichols or online from their website. We were sent our 2 packets to review and they're lovely. It's not often my veggie kids get to eat marshmallows, and we've all enjoyed them very much! 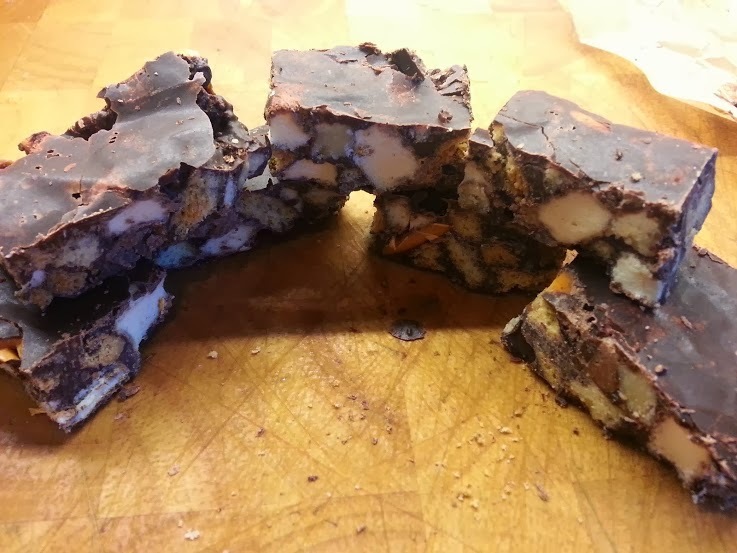 Oh I do like a good rocky road and this looks delicious! 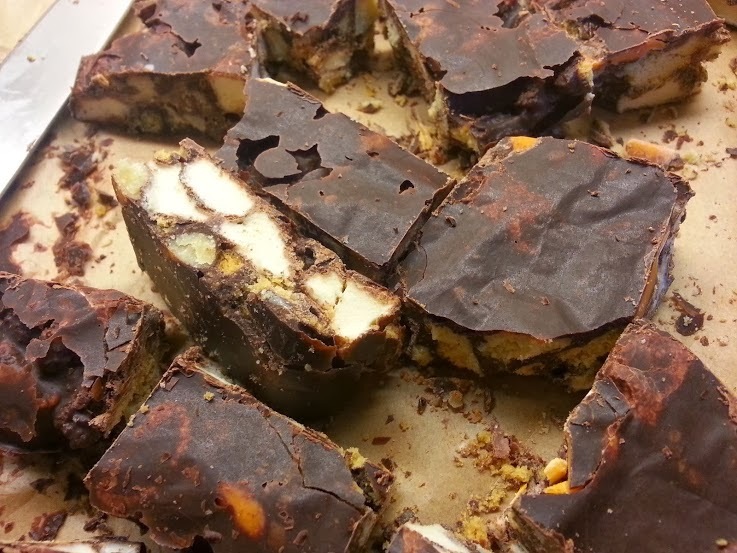 Oh My Word - you have made my day; Vegetarian Rocky Road - does life get any better?! Ok, don't shoot me but I've never heard of Rocky Road before!! Looks like an interesting combination and great for the kids to get involved with making it. So do I - I can't believe how lovely it is, I've not had it in such a long time! Wow! 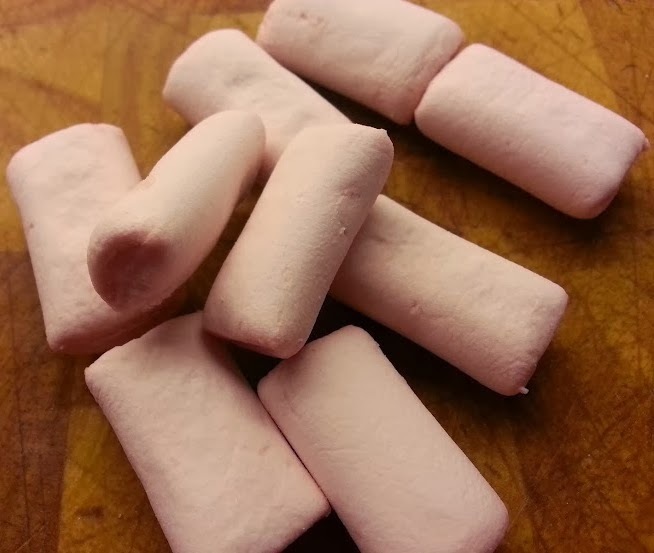 its amazing I think that Marshmallows initially were being created using the gelling broker mucilate, manufactured from the get with the marsh mallow place.